This second book in the Vasquez and James series and is another excellent example of just how amazing Lou Sylvre is... LOVED IT!!! Lou Sylvre, once again delivers a compelling, exciting and suspense filled slice of Luki and Sonny’s world, in Loving Luki I fell in love with her beautiful prose that endeared me to these two flawed and broken characters who are still at the fledgling stage of their relationship. The prologue to Delsyn’s Blues is heart breaking, and the consequences of this are the back bone to the story and our boys are once again embroiled in the middle of all the action, this time Luki needs to call on his AFT experience with more than a few favours called in to deal with murder, arms and drug running which see’s our boys faced with yet more challenges, and they need to draw on all their strength to to survive yet another event that could see that tentative relationship come crashing down on them. After the trauma and heartache in Loving Luki, Sonny and Luki had at least had a little reprieve to get to know one another, that is until the tragic event happened, which left Sonny a shell, and numb to everything around him. He had lost his will to fight and both his body and soul were wracked with grief, he feels culpable, in his mind it was all his fault and it was that guilt that drives Luki away. However, Luki is a stubborn SOB, he is hurt that Sonny has pushed him away but the love he has for his man is too strong and luckily Sonny realises he needs Luki and finally lets the man he loves, back into his life… to take away the pain and at least give him some peace from the nightmares. Sonny being arrested for murder and finding drugs and guns under their house has them looking more closely at the man that has made Sonny’s life a misery but he is not alone in his crimes and little do they realise that there is someone much closer to home that is the real enemy. The clues to the investigation are nagging at the back of Luki’s mind but his concern for Sonny is clouding his judgement, whilst Sonny buries his head in the sand, internalising his feelings with his exterior calm but distant, the enormous impact of what has happened, he seems to dismiss, not quite ignoring but putting his trust in Luki to make the right decisions, to just make it all go away, blocking out external influences, being quite happy in his own little Sonny world. These two men are not perfect by any stretch of the imagination, they seem to make one bad decision after the other, with Sonny giving me a real WTF! where did that come from? moment. You see Sonny cannot lie so if Luki asks a question he tells the truth… NO! in this case a white lie will do! and just when I thought it was all going so well Luki’s green eyed monster came into the picture, I was all but throwing my kindle out of the window and to say I was pissed off at him would be an understatement. But I like that these two characters are not perfect, they make mistakes in life the same as we do, but they are strong, and they need that strength to to survive but they also need to trust and understand that being vulnerable, and needing someone is not a weakness. It was a little late in life, Luki thought, for him to finally start getting it. What it meant to love someone. Love a man so much you wanted to make a life with him. So much you were willing to help him through the darkest times, accept his needs along with his strength, see both as parts of what, all together, made him beautiful. And to let him do that, for you. 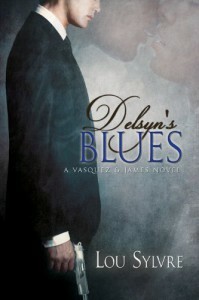 In Delsyn’s Blues we have a better understanding of Luki and Sonny with more of their complex lives and characters revealed, they themselves do some soul searching, and delve deep into the depths to the parts of them that had long since been buried, to the men they had been before the void in their hearts had been filled with love... something they had yearned for but never dared to feel. This gives us as readers an insight into the fabric of the men so damaged by their past, rendering them incapable of trust never mind allowing another into their hearts. Luki even now to the outside world, he was cold as ice, a man in control, but for Sonny that guard, that persona disappeared and he saw the true Luki. The man that loved Sonny more than life itself, and with Sonny being such an open book, incapable of lies or deceit the love and affection and deep seated trust was mirrored. I love this series and the excellent and at times beautiful writing from Lou Sylvre, through her words the emotion, heartbreak, fear, love, uncertainty, hope, all of it, I feel and experience… she puts me right there with them and I am now hooked and totally invested in the future of these two characters that I have come to adore.